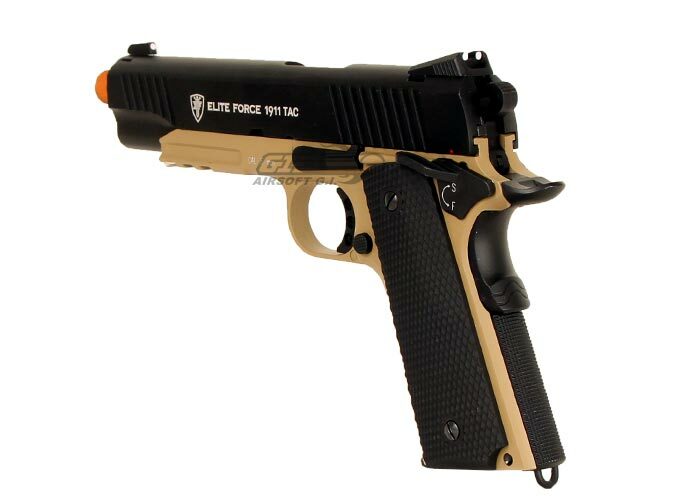 The Elite Force Full Metal 1911A1 is another testament to Elite Force's continuing dedication to creating great airsoft guns that are both budget friendly and highly durable. This 1911A1 features everything that you would find on a real steel piece; everything from the iron sights to the beaver tail is present and full functional. The rear slide serrations and textured grip ensure that the user maintains a positive grip on the weapon even during high speed transitions and maneuvers. The slide also features the Elite Force crest as well as their trade marks on both sides. 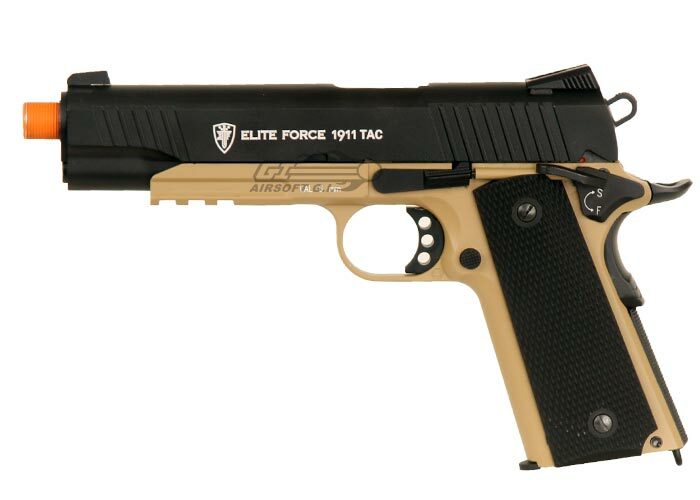 Internally the Elite Force 1911A1 is rock solid and is more than ready to use the CO2 magazine that it is included with. When firing this 1911A1 on CO2 you will be blown away, the kick is incredible! With each shot the slide recoils very crisp and fast producing a very hard kick. The Elite Force Full Metal 1911 is definitely a show stopper, and at this price is affordable for most budgets making this gun a definite hit. Barrel Extension and Flashlight are NOT included. When I first got this I used .20g bbs and no matter where I put my hopup they were always over hopping, this made it seem like the hop up unit it came with didn't work. Looking online others had the same issue and the fix is use at least .28g bbs. Once I used the heavier bbs my hopup worked as intended. Make sure to grab some heavier bbs to use with this. This 1911 is a decent gun but i do think its over hyped. The full metal gbb gun has a nice feel and weight to it with some nice kick-back. The gun looks very nice. this gun does have hop up but with .20 any hop up makes the bb curve up quite a bit. i found that .25 with 0 to 1/4 hop up seems to work best. this gun isnt very accurate at all. paint wears off rather quickly. overall id say its a DECENT co2 gbb, not very accurate tho. 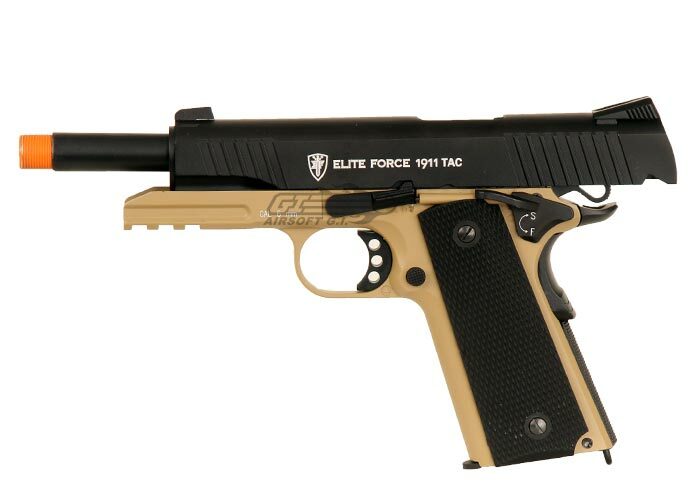 I bought this gun and gave always loved it, Elite Forve is a great company for quality and this is a quality pistol. Fair Price and Great Performance, this gun has always amazed me and I have never really adjusted anything just clean it and oil it and it shots like the day I got it. What other silencer fits on this? thats more slimmer than the one in the photo? Any silencer with a 14mm negative thread. Will any brand co2 work/fit in the magazine? I plan on using cross man branded co2 will this work? Crosman Co2 has the chance to damage the magazine crush valve. We recommend purchasing Co2 from a certified airsoft retailer. Does the mag drop freely upon reload? The mag will drop when you press the mag release, but I wouldn't recommend doing so. what co2 do you use? 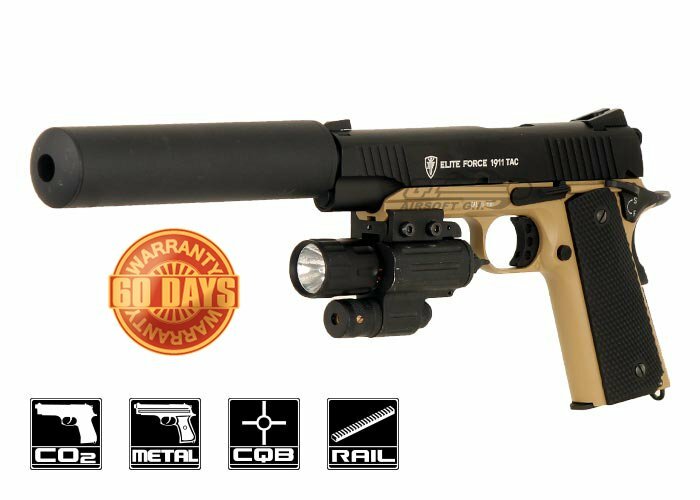 Both of these are discontinued but the suppressor looks to be about 5 inches long and the light is a laser/light combo for pistols. It is a proprietary bucking made by KWC. can you put a suppressor on it "read explanation"
You can mount a mock suppressor on it, the mock suppressors acts as a barrel extension to shield a longer inner barrel from damage. My 6mm .20g bbs seem too big to safely force into the mag. Do I need different bbs? This, and almost ever other airsoft gun use 6mm bbs. Is the safety suppose to only go up when the gun is primed with the hammer back because mine does not go on safe with the hammer up. Is that suppose to be like that and the safety on the right side is a little higher (like rotated) then the left is that normal to? Plz answer before I shoot it so I could use the warranty! The safety should not engage if the slide has not be cocked back. If you are experiencing issues with the airsoft gun please contact our customer service department for more information on resolving the problem. What type of lubricant should I use? What brand and viscosity or will WD40 work? You will need to have one custom made. Yes we can ship airsoft guns to the U.K.
Where can i get another tan lower and or replacement parts? You may need to contact Elite Force directly. Do u take PayPal ??? please contact our customer service for details. which serpa holster would fit and when will you have that one hopefully before christmas. What are the chances of a internal problem with the hammer lock? I had bought one of these 1911 pistols and right after 40 days, the hammer had not locked back for the next shot. when i manually released the hammer, the Co2 gas had all shot out in one quick loud burst and the hammer has not been working since then. What supresseer do you have on the gun? Surprised no one answered this. Most Co2 blowback pistols can be dry fired however if you don't mind the internals bring beat up from the force of the blowback feel free to dry fire. This 1911 does lock back when the mag is empty and I suppose it can be used a a training pistol. is this gun madbull barrel compatible? 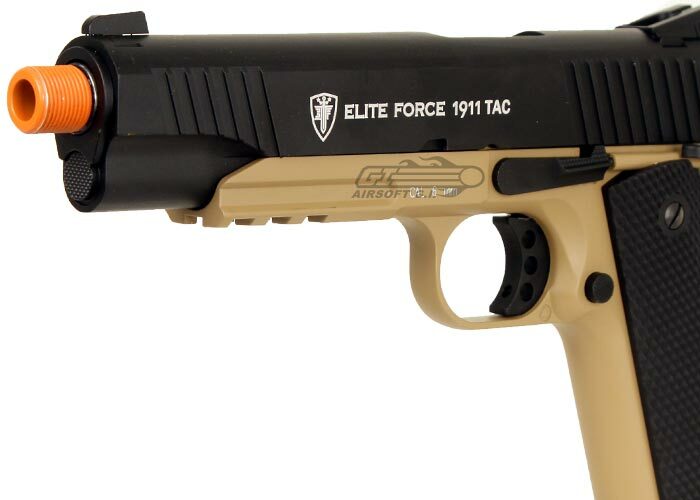 does this gun Elite Force 1911 Tactical CO2 Blowback Airsoft Gun (BLK/DEB) come with a magazine or does one have to be purchased when the gun is bought? Since it is full metal t does quite well. Dropped it a few times on wood from the hip and it is surviving with little or no paint loss. (Maybe a little late) it depends on your personal preference mostly, if you want to do like milsim and stuff then take the tac and load each mag with 7 rounds (like a real 1911) and enjoy the realistic recoil, if you want to play 100% competitive then maybe go with the acp for the extra mag capacity it just depends on what you plan on doing. what is the actual fps? is the cartridge held inside the grip? Are there any high cap mags for this gun? Hard Shell Holster without external upgrades? What hard shell holsters can fit this pistol without the external upgrades. G Code Holsters should work well but some slight modification might be required for optimal fitment. It should have 14mm counter clockwise threads. Any laser / light that can mount to a 20mm rail should work. You can get about 2 mags through with one CO2 cartridge in warm weather. Colder weather will be another story. Whats the inner barrel lenght for this gun? How long is this pistol? I'm getting a blade tech holster and i dont know what size to get. About 7.5in without the barrel extension. Barrel extension is not included. 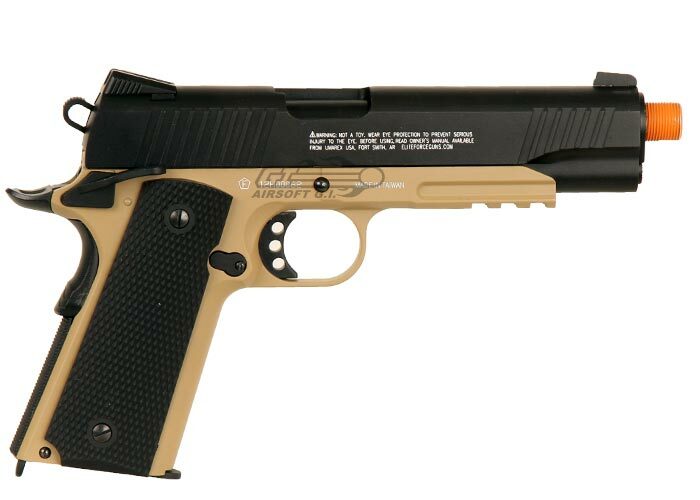 The reason we do that is because it gives other people an insight as to what you can do to customize their airsoft gun. how much does this pistol weight? Because I might buy it. if the mag leaks gas and your warinty is over what do you do? What mags fit this pistol that you sell on this sight? Would 12g CO2 cartridges work? What's the FPS out of the Box? The FPS is listed as 360-370 per product specifications. I've been torn between three CO2 GBB pistols: 1. KJW XCELERATOR "6, 2. 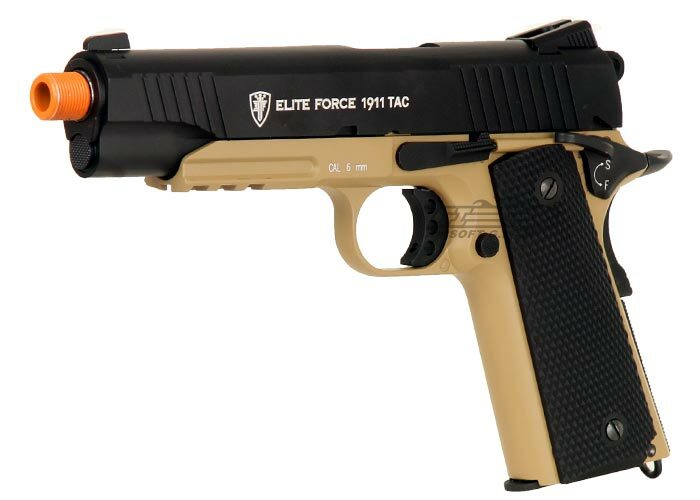 Elite Force 1911Tac., 3. Marushin FN Five-Seven. Which one is best? Thank you! I like the Tac, although the durability won't be exactly long. all are good quality but it just comes down to would you like a 1911 or a five seven. Where to find extra mag? 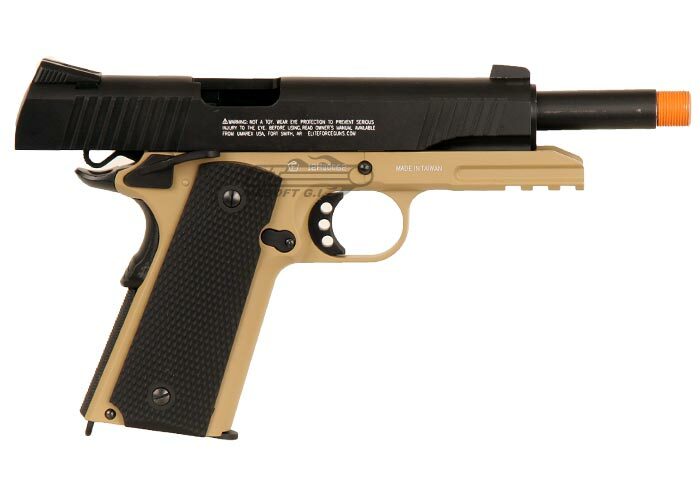 http://www.airsoftgi.com/product_info.php?products_id=10161 The Elite Force Co2 Full Metal 1911 should fit any Single stack KWC Co2 Magazines as well. Were could I find the suppressor? Airsoftgi can you send me a link to a suppressor that you recommend for this gun? Thanks! 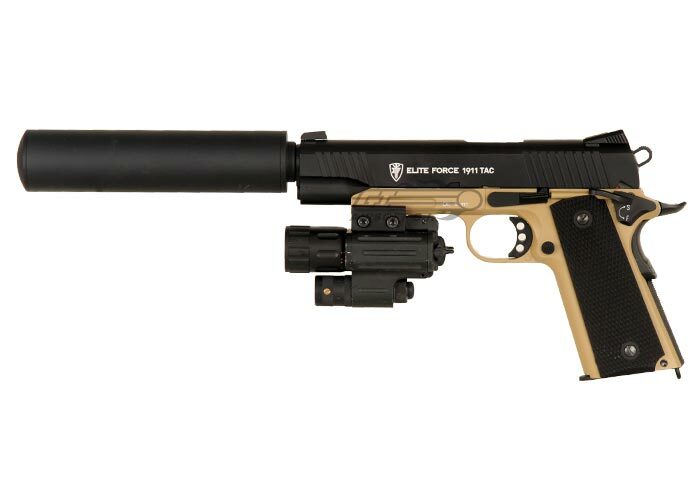 I as well didn't know that at first and I was talking with my friend and he said the same thing except on his GBB it frayed the tread and silencer wouldn't stay on so he recommends not getting a suppressor and just get a more expensive tac light with a strobe and pressure feature. You may wish to consider the "tornado" holsters, which are adjustable to accept pistol lights.